The Better ‘n Eggs Fit2Fight Campaign means a lot to me because Type 2 Diabetes has not only affected my family, but my husband’s as well. Both our fathers are affected by the disease, and now that we have a daughter, we are more concerned than ever about stopping this disease in its tracks and finding ways to control and prevent it. We want our daughter to have her grandfathers around for a long time, but we also don’t want her to have to suffer the ill effects of this disease herself. The Better ‘n Eggs Fit2Fight Campaign aims at doing just that. Join the Better ‘n Eggs Fit2Fight Campaign Today! With November being National Diabetes Awareness Month, there is no better time to talk about this disease and how it can be prevented. I have watched my loved ones not take care of themselves despite suffering from Type 2 diabetes, and as a result their health has deteriorated drastically in only a few short years. That’s why the Better ‘n Eggs Fit2Fight Campaign is so important in raising awareness of this disease. Crystal Farms® Better’n Eggs ® and AllWhites® are fat-free, cholesterol-free, and low-calorie alternatives to shell eggs, yet are made from real eggs! Made from eggs whites, they have half the calories of shell eggs, therefore allowing those suffering from Type 2 diabetes to enjoy the foods they love without worrying as much about calorie count. Egg whites are also known to increase recovery time from hypoglycemia by building up adrenal glands, helping to regulate blood sugar. Crystal Farms® Better’n Eggs® and AllWhites® are convenient sources of lean, high-quality protein, which can help control hunger, keeping diabetics fuller, longer, and subsequently helping with weight loss. Crystal Farms® Better’n Eggs® and AllWhites® can be used in any recipe that calls for eggs and are very convenient and versatile. Since they are pasteurized, fresh eggs whites, they can be eaten raw, and can therefore be used in recipes such as smoothies. Heat oven to 350°F. Spray 11×7-inch glass baking dish with nonstick cooking spray. In medium nonstick skillet, heat olive oil on medium-high heat. Add onions. Cook 2 to 3 minutes, stirring occasionally, until onions are soft. Add mushrooms. Continue cooking until mushrooms are soft. Remove from heat; stir in basil. In medium bowl stir together AllWhites, salt and pepper. Stir in mushroom mixture. Pour into prepared baking dish. Sprinkle with cheese. Bake 18 to 20 minutes, or until eggs are almost set. Cool slightly. Trim rounded edges off multigrain wrap to make 7-inch square. Cut wrap into 49 (1-inch) squares, discarding one square. Cut baked frittata into 48 (1-inch) squares (cutting 8 crosswise; 6 lengthwise). 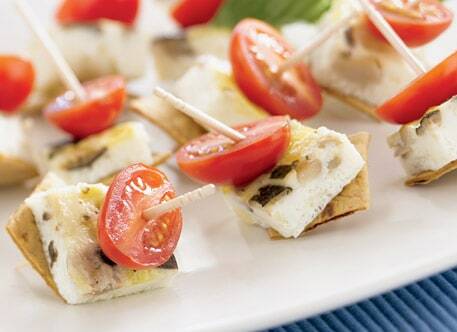 To assemble appetizer thread 1 square wrap, 1 square frittata and 1 half grape tomato onto toothpick. Continue with remaining ingredients to create 48 appetizers. Serve at room temperature. Be sure to check their website for yummy recipes!! From appetizers to desserts, Crystal Farms® Better’n Eggs® and AllWhites® can be used in delicious recipes such as: Bacon Cheddar Mini Egg Cups – Mini Turkey Meatloaves – Almond Crusted Walleye – Vegetable & Grain Quiche. Along with my father and father-in-law, I will be joining Bob Greene, Oprah’s personal trainer, for a Twitter party. Time: from 8-10pm EST at. Bob will be discussing ways to help prevent Type 2 Diabetes, such as replacing high-fat, high-cholesterol foods such as eggs with alternatives like Crystal Farms® Better’n Eggs ® and AllWhites®. You can win lots of great prizes such as an elliptical, $100 visa gift card, a food scale and more. For more information check this website. Type 2 diabetes is a serious illness, but with awareness such as the Fit 2 Fight Campaign and proper lifestyle changes, it is both preventable and manageable. Now, what are you going to do about it? I am a marketing and communications specialist and a novice at this whole mommy thing! I am about to enter Q4 of my maternity leave with my first baby, a little girl named Danica, and am living and learning so much more than I ever imagined! I clicked this post because of the awesome food photo! My granddad has Type 2 diabetes and it is not fun, thanks for the info and the link on the topic! This is a great blog with many useful info. I hope more bloggers would follow your lead & help increase public awareness about diabetes. Again, thank you! Yeah, Great to read this type of Diabetes Type 2 blog. I would love to view more and more type 2 diabetes treatment blogs with additional information. Will Real-Time Pregnancy Monitoring Help Curb Maternal Deaths?